Note 2. The definition of the drainage channel which crosses hole 2 as an obstruction, extends to the left past the hole 3 teeing area up to the point where the channel is defined as a lateral water hazard. 3.1.2. Immovable Obstructions Close to Putting Green (e.g., Sprinkler Heads, Green edging barrier) interfering with an intended line of putt. This local rule provides additional relief near the green from an obstruction on the line of play. 3.1.3. Distance-Measuring Devices. Rule removed and left blank. 3.1.4. Drop zone and water hazard (yellow stakes) issues. b.1. For hole #11, as an additional option, drop a ball, under penalty of one stroke, within two club lengths of the margin of the hazard on a line from the point where the ball was last played and the point where the ball last crossed the margin of the hazard. The use of the existing drop zone to the left of the hole which avoids the hazard is not an option for RBIMGC events. b.2 For hole #4, as an additional option, drop a ball, under penalty of one stroke, in the dropping zone located past the maintenance yard on the lower level. 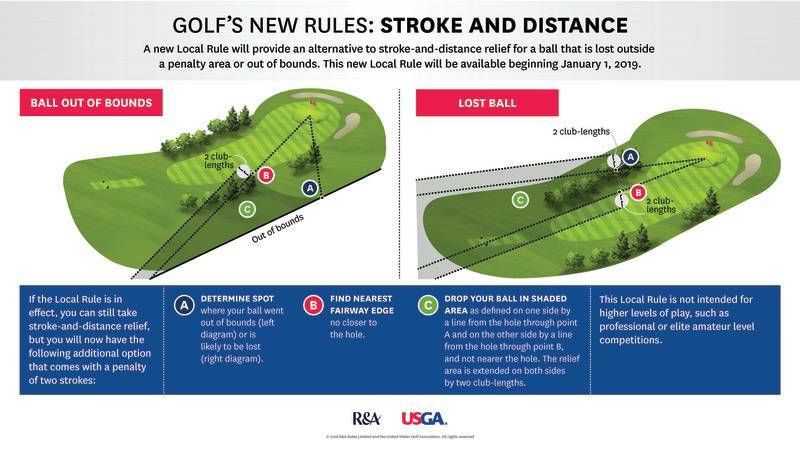 NOTE, The previous local rule permitting a player to drop a ball in the drop zone on hole 4 under penalty of two strokes without putting a ball in play from the from the upper tee position is withdrawn. 3.1.5. Flowerbeds and Newly sodded areas. 3.1.5.1 Around various hole monuments. 3.1.5.2 Beyond the lake on the left of hole #1which is also on the left of hole 18. 3.1.5.3 Beyond the green on hole 6. 3.1.5.5. To the right of the green on hole 9. 3.1.5.5 On the left side of the fairway to the left of the cart path towards the green on hole #10. Re-sodded areas may or may not be identified by white lines. Unsurfaced paths which are used for maintenance purposes and which are not out of bounds are defined as obstructions and relief may be taken without penalty in accordance with rule 24. These paths are to the right and the rear of the green on hole #1, on the left side of hole #8 from where the cart path swings across the fairway to past the green and to the left of Hole #12 approaching the green. Relief is taken without penalty at the nearest point of relief. 3.1.7. Additional relief for a ball out of bounds or lost outside of a penalty area..
“When a player’s ball cannot be found or is known or virtually certain to be out of bounds, the player may proceed as follows rather than proceeding under stroke and distance. Last crossed the edge of the course boundary to go out of bounds.For purposes of this Local Rule, “fairway” means any area of grass in the general area that is cut to fairway height or less. The player has played another ball provisionally under penalty of stroke and distance (see Rule 18.3).”3.1.8. Out of bounds.For RBIMGC events, out of bounds are defined for certain holes as follows:3.1.8.2. Hole 16. Out of bounds is defined by the left edge of the curb on the left side of the cart path. The margin of the lateral hazard along the right side of hole 9 is defined as the right outside edge of the main cart path starting from the red stake at the point where the main cart path approaches the hazard and turns left to run close to and parallel to the hazard. Where the path from the cart barn and the main cart path intersect, the rough concrete beyond the edge of the main cart path is in the hazard.3.1.10. Embedded Ball. Rule removed and left blank.3.1.11. STAKED TREES. Through the green, a ball that comes to rest in or on an aeration hole may be lifted without penalty, cleaned and dropped as near as possible to the spot where it lay but not nearer the hole. The ball when dropped must first strike a part of the course through the green. On the putting green, a ball that comes to rest in or on an aeration hole may be placed at the nearest spot not nearer the hole that avoids the situation. 3.2 THE FOLLOWING LOCAL RULES WILL BE IN EFFECT WHEN INVOKED BY THE TOURNAMENT DIRECTOR FOR A SPECIFIC EVENT. Staked trees and any supporting wires or ropes are defined as immovable obstructions. If the obstruction interferes with the with the players stance or the area of his intended swing he may proceed drop a ball within one club length of the nearest point of relief without penalty under rule 24-2. 3.1.9. Margin of the lateral hazard to the right of hole 9. 3.1.8.3. Hole 17. Out of bounds is defined by the left edge of the cart path from the tee up to the end of the hedge adjacent to the bunkers on the left of the fairway and by white stakes around the open area beyond that point. Out of bounds is again defined as the left edge of the cart path from the last white stake where the open area ends to the 18th tee. 3.1.8.1. Hole 14. OOB is defined by the left edge of the cart path from the tee to the point where the ice-plant ends and by white stakes beyond that point. Where there is an exit path into the residential area, out of bounds is defined by a white line across the path or white stakes. Out of bounds on the course is generally defined by white stakes or white lines. If stakes are used, the out of bounds is defined by the inside face of the stake at ground level. Where a white line is used to define OOB, the line is out of bounds. Where both are used, the stakes identify out of bounds and the line defines out of bounds. A ball is OOB when all of it is OOB. Player may stand OOB to play a ball lying within bounds. A ball lying through the green may be lifted without penalty and cleaned. Before lifting the ball, the player must mark its position. Having lifted the ball, he must place it on a spot within one club-length of and not nearer the hole than where it originally lay, that is not in a hazard and not on a putting green. A player may place his ball only once, and it is in play when it has been placed (Rule 20-4). If the ball fails to come to rest on the spot on which it was placed, it must be replaced without penalty. If the ball when placed comes to rest on the spot on which it is placed and it subsequently moves, there is no penalty and the ball must be played as it lies, unless the provisions of any other Rule apply. The heart of a fair and equitable handicap system is an accurate and properly filled out score card. The RBIMGC uses special computer-generated score cards prepared by Tournament Directors for club scheduled events. Two identical cards are generated for each team. The name of each team member is pre-printed on the cards along with his current handicap. Depending upon an individual’s handicap, strokes are assigned to each hole in the form of asterisks. Other information pre-printed on the cards may include the date, the team # and the starting hole. Unless specifically indicated otherwise by the TD, all members shall play from the white tees. The two score cards are to be filled out as play progresses by two members of the team (the score keepers). Individual gross scores are entered on the score card as soon as the hole is finished. To determine a team net score for a given hole, the score keeper simply subtracts the number of strokes each player is assigned on that hole from his gross score on that hole. The format announced for the event will determine how those individual net scores are used to establish the TEAM NET SCORE on the line below the players’ names. As each hole is played, record the gross score for each player, the Team Net Score and the Cumulative, or running total team net score. Circle the individual scores that are used to compute the Team Net Score for each hole. At the end of play, total all individual gross scores and record on the card. Determine individual net scores by subtracting each person’s handicap from their gross score. Make any adjustments to the individual gross scores using the Equitable Stroke Control (ESC) Chart posted on the Bulletin Board at the RB Inn, and shown below. Enter the Adjusted Score for each player in the appropriate column on the score card. If no ESC adjustment is needed to a member’s gross score, please place a dash “ – “ in the appropriate column on the score card to indicate to the TD that no ESC adjustment is needed. Total up the team’s Cumulative Net Score and circle it. After all data is entered, one score card must be signed by the score keeper and attested by another member of the foursome. One score card, signed and attested, must be given to the Tournament Director (TD) for that day in the Veranda Sports Bar. Each individual is responsible for posting their gross score or, if need be, their ESC adjusted score, as discussed in the next Section. All team members are responsible for the accuracy of their score cards. Both team score keepers should regularly compare score cards throughout the round and at the completion of the round to verify that both score cards have the same scores for each team member. Any score discrepancies must be resolved before the signed and attested score card is presented to the Tournament Director. If score cards are submitted which are incomplete, the Tournament Director may disqualify both the team and the individuals from prize money for that tournament. Score cards submitted that contain inaccurate math or scores do not add up, do not, in themselves, constitute an error that can be penalized by disqualification. If a contestant is observed to violate a rule during a tournament and does not announce this violation in accordance with the Rules of Golf, he should be advised of this violation by the observer(s) immediately after the violation occurs. The violation will be reported to the Tournament Director. The Tournament Director will determine if a disqualification is appropriate under Rule 33.7. If the contestant is not notified of the alleged violation by the observer(s) immediately after the alleged violation occurs, there is no basis for a violation. A contestant disqualified under this section may appeal to the Rules Committee. Please note that the Handicap Committee is empowered to assess penalties for violations occurring on the score cards. The penalty is imposed after a warning. A penalty by USGA definition is a score posted by the Handicap Committee for a player who does not return a score or, otherwise, does not observe the spirit of the USGA Handicap System. Stroke Play – When competitor’s scores are tied after a stipulated round, ties will be broken by matching the competitor’s scores, starting with the total net for the nine holes played on the back nine holes, then the last six holes played on the back nine, then the last three holes played on the back nine, then the last hole to the first hole until the tie is broken. Match Play – When competitors are tied or all holes are even after a stipulated round, the tie is broken by playing extra holes continuously from hole number 1 until the tie is broken. Net scores using handicap and strokes defined by hole will be compared.